I made this bib for my sister in law expecting a baby in February. We had a shower for her about a month ago that I hope to do a post on soon :) She likes to use the word fool a good bit like "that fool just cut me off" for example. I knew she had seen this phrase on pinterest before too and liked it. My mom and I found this free bib pattern for a reversible bib and I found some soft white fleece in my fabric stash as well as some fun gender neutral red and yellow fabric in her stash. I went with the toddler size bib thinking that the baby wouldn't really be wearing a bib until around 6 months and a bigger size will get longer usage. I wanted one side with the white fleece and one side with red. We cut out the fabric using the pattern and followed the instructions but instead of having the raw edge (which would have been fine if not using fleece for one side) I liked the idea of the bias tape going around in a coordinating yellow color and adding some color to the white side. The bias tape part was the trickiest piece and next time hand basting first would be a big help. After it was finished, I created the words design in my Silhouette software and printed it out on red heat transfer vinyl and ironed it on. She got a great laugh out of it when opening it at her shower! Can't wait to see my newest niece/nephew in it! I highly recommend the bib pattern, it was very easy to use. My favorite Christmas present I received was this handmade Nativity set from my mom. After her and I found this stable at a local antique mall, I really wanted a set made from the pegs like she does for Disney Princesses, super heroes, etc. So it wasn't a surprise but I cannot imagine all the time and effort that went into this gift. There are 3 camels, 3 wise-men, 2 sheep, Mary, The Angel, Baby Jesus, Joseph, a donkey and 2 shepherds. And the addition of the wooden star to the stable completes the scene. Each peg is so detailed (even more so than this photo does justice) and I know it will be something I look forward to putting out every year. I think this just goes to show how much handmade gifts are appreciated. I love making gifts myself, looking through things people make and design on Etsy and buying at local shops. So much thought goes into these types of items and isn't just something you can pick up at Target that a million other people have too (don't get me wrong... I really like Target, I just think handmade gifts are exceptional). It's fun to think about passing down these handmade things to future generations too just like when my mom gives me something that was made for her or for my grandmother etc. it feels special to have something that was theirs. Hope you had a wonderful Christmas! We had a great Christmas and we're so lucky to be able to stay in town this year. 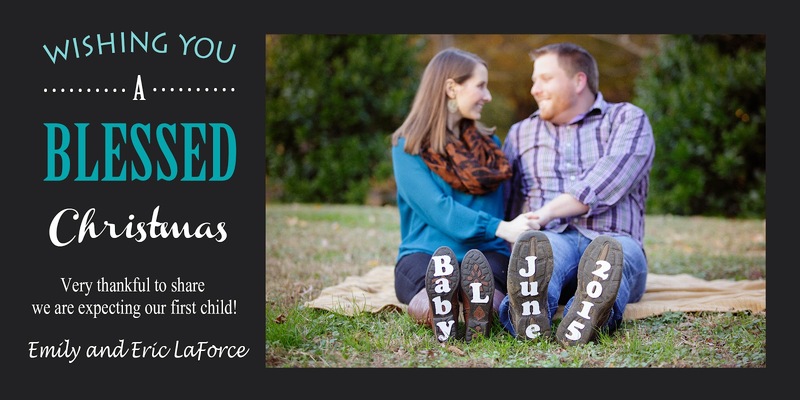 We shared some big exciting news on our Christmas cards this year (and also on facebook a few days before our cards were mailed)! Thanks to Brittany Lauren Photography for capturing this fantastic photo. We feel so blessed this year and have so much to look forward to in 2015. Can't believe that is just 4 days away!! Merry Christmas and a Happy New Year from our family to you and yours! Oh and I'm really proud of myself for designing our card myself this year in photoshop... making different cards and quotable prints has been so fun. This year for girls Christmas baking day, I decided on a bar cookie since the past few years I've done drop cookies. I looked through a cookie exchange cookbook my godmother gave me and picked Toffee Squares. I thought they would be so much easier than drop cookies and they were for the 2nd batch due to some modifications to the original instructions but the 1st batch didn't turn out exactly how I hoped. I've adapted the recipe and instructions below so you have an easier time. I love how most of the ingredients are things you usually have on hand. I highly recommend the cookbook though for anyone that like to make cookies... it has so many different kinds of cookies and great tips for hosting a cookie exchange (and drink recipes). Preheat oven to 350 degrees. Line 13 by 9 inch baking dish with parchment paper. In large bowl beat together butter and sugar on medium until combined. Beat in egg yolk, salt and vanilla. On low gradually beat in flour just until mixed. Press dough evenly onto bottom of baking dish parchment. Bake in center of oven for 20 minutes. Melt chocolate chips in microwave (50% power 30 seconds at a time until you can stir it well into melted chocolate). Pour over crust and spread evenly with a spatula. Top with nuts and toffee bits. Toffee should be completely cooled before cutting into squares. I actually put mine straight in the freezer to store it for a couple of weeks. The night I needed it, I took it out that morning and once thawed cut into squares. So this recipe freezes really well! The first batch I did, I followed the book's instructions for the chocolate and it didn't melt at all. So I ended up with a topping that didn't stick well and felt apart a lot but it still tasted great... just not the pretty and easy to eat kind. I highly recommend you apply the chocolate like I described earlier. This is what it looked like before I put the pyrex lid on stored it in the freezer. Pretty cookie display at our party. Some other cookies from the cookie exchange are there too... thumbprints, shortbread/snowballs, butter cookies, gingerbread cookies. Toffee is one of Eric's favorites so he really appreciated the choice of cookie this year and I do have to say they are quite delicious! We now have a few H&M stores in town but sometimes they are hard to look through since it seems like stuff is everywhere in there and not well organized. I decided to give ordering online a try and ordered this $10 "jersey top" a couple of months ago that comes in a ton of colors. It's really just a thin soft flowy top.. not sure why it is called jersey. It was perfect with a camisole underneath it but if you got it in a darker color then you might not need it. I don't usually like to take photos inside because the lighting isn't as good but it was raining outside. Our Christmas mantle this year is just slightly different from last year. Of course the wooden reindeer I got at HomeGoods last year had to be up there again. The Santa basket on the floor is also from my godmother. And the stockings were made by my mom. The garland is from target. Whenever we are home we have our mantle lights and tree lights on because you can only enjoy them for what seems like such a short amount of time... and where in the world is the month of December going?!? Here is the mantle from last year. One year I'm going to think about doing something more white/silvery/gold instead of the typical red and green. 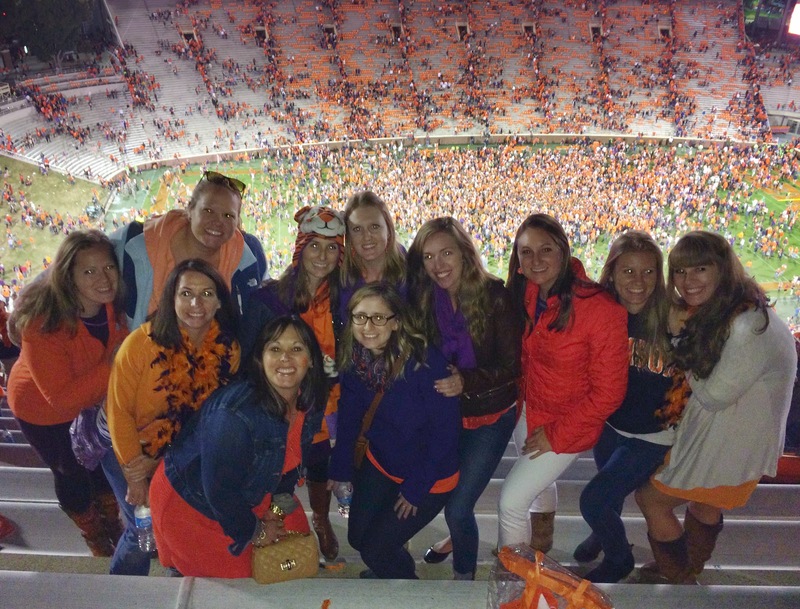 This was the 8th year that we had our roommate reunion in Clemson! This year it was the Clemson vs. Syracuse weekend of Oct 19th. Eric and I drove down to Clemson Friday afternoon and walked around downtown with Vickie and her boyfriend Kelly. It also happened to be Clemson's Homecoming so we got to see some of the Bowman floats. Eric and I had some time to kill before having dinner at Mellow Mushroom so we went to one of our favorite spots on campus... the amphitheater. Then we went to Mellow Mushroom and met up with some roomies and friends at Tiger Town like we do every year. The next morning we were out at Strom bright and early for the Morgan tailgate graciously hosted by Vickie's parents each year. We had breakfast and caught up with everyone and watched some tv. We had lunch and played tailgate games. I was able to see my other friend named Brooke and her sweet family for a few minutes. Of course we had to do a roomie photo session. Love these 3 so much! Then we headed into Death Valley before kickoff. Night games are always really fun even if it makes for a long day and no relaxing at Tiger Town afterwards. CLEMSON WON! And all the girls from the tailgate (roomies and friends) were able to get a photo together. That wraps up another wonderful roommate reunion in Tiger Town! So glad w are able to get together every year! My mom has made squash casserole for years and got the recipe from my grandmother a long time ago. I made it for Thanksgiving this year but decided it would be nice to add zucchini to the mix to make it more colorful. This would be a great dish to make for the holidays or any other gathering. I made it a day ahead, stored in fridge and cooked it right before eating. I ended up with enough for 1 1/2 casseroles since I bought extra ingredients so you can easily adapt it to what size you need but below is the recipe for a 13 x 9 size dish. Boil zucchini, squash and onion in a big pot of water until squash and zucchini are tender. Drain. Smash well with a fork to get all the water out. You may need to let this sit for a bit for the water to all drain out and for it to cool. Once cool enough to not scramble the egg, transfer to a large mixing bowl and add beaten eggs and season well with pepper. Stir in about half of the cheese, leaving the rest for topping. Spray 13 x 9 dish with cooking spray. Spread mixture into dish and top with remaining cheese. This was the first time I've brought this to Eric's family Thanksgiving and it was a big hit! Enjoy! I made this DIY Wood Block Nativity set last December for my godmother and by the time I finished it was too late to post for it to be of use to anyone else so I've been holding onto this for almost a year. But now you have about a month to make one for yourself or for a gift for someone else! It wasn't a quick craft considering paint drying time and such but I am really happy with how it turned out. - for the images I cut white vinyl on my Silhouette machine using purchased nativity set shapes that I sized all together to fit on the blocks ($3 for 3 sets of shapes). If you are a painter you could also just paint or draw on the images but I am not a painter. I did the stable by making the shape with painters tape to get the shape I wanted but every other shape was from the Silhouette shape "store". Cut the blocks as shown above or ask your husband nicely to cut them :) I wrote a name on the bottom on each one in pencil so I could keep track of what it was. Paint the blocks on at least the sides that will be showing or you can go ahead and just paint all the sides. You can use cheap sponge brushes. Follow the Silhouette instructions for adhering the vinyl to the blocks. Here are close ups of all of the blocks. There is extra of your 2 by 2.5 inch piece of wood so I used that to stabilize the stable since it is a bigger piece of wood and could easily fall over. Pun intended. I just screwed it into the back at the bottom. My godmother loved her gift and it was fun to make a handmade nativity set that will last for years to come! This would also be a great set for kids to play with that they couldn't break. If kids are playing with it just make sure all the edges of the wood are sanded well. The key to successful tailgating attire in the fall is layers since it starts off cool in the morning and gets warm mid-day and then can get cool again in the evening. That is exactly what I did for a Clemson game near the end of October. I had a denim jacket on in the morning and evening (plus a tiger hat that evening since it was a night game) and then below is what I wore the rest of the time. I could have easily taken off my fleece leggings too when it got warm but we were in the shade most of the time so I was fine to leave them on. A shift dress can also be a great game day option so you can fill up on all the delicious tailgating food!! And just for fun here is one of me and the husband. He hardly ever gets cold so layers weren't necessary for him. I got excited when I saw this recipe and it said crock pot. Well it is not really a crock pot recipe per say... I suppose while it cooks for about an hour and a half that could happen in a crock pot but this is not a dump in the crock pot and forget about it kind of meal so it was easier for me to do it on the stove top. I was in the mood for a dish filled with lots of delicious veggies so it fit perfectly and would also be great with some grilled chicken. Just a fair warning that there is A LOT of chopping so if you have a chopping tool or something, use it! Peel and chop all vegetables. You don't need to peel the ones you wouldn't normally like the zucchini, tomatoes, etc. Yes this is so much chopping. Cook onion in olive oil and add garlic after a few minutes. Go ahead and do this in a really big pot that you will be using for the stew. When onions are golden add the rest of the vegetables, the bay leaves and the water. Stir. Cook over low heat for 1 hour and 20 minutes but add the beans halfway through. Wash the quinoa using a strainer. After the 1 hr 20 min, add the quinoa, stir and cook another 10-15 minutes. Season with a little olive oil, salt and pepper. I would make this again but make sure that I cooked the quinoa long enough. It was a tad undercooked... I think we were too eager to eat. Hope you enjoy!